KIEV, December 12. /TASS/. Russian Emergencies Ministry’s humanitarian truck convoys have delivered another batch of humanitarian supplies to eastern Ukraine’s cities of Luhansk and Donetsk, a ministry official told TASS on Friday. “More than 80 trucks have safely arrived in Luhansk. They have delivered more than 800 tons of humanitarian cargoes - mainly food products and equipment for social facilities’ operation,” the official said. According to him, the trucks’ unloading has started at warehouses. As for Donetsk, over 50 trucks with humanitarian cargoes have arrived in the city, according to the ministry’s community awareness department source. The total weight of the humanitarian supplies to Donetsk exceeds 400 tons. According to the source, no incidents have occurred during the convoy’s journey. “The drivers are feeling well. After the unloading the trucks will travel back to the Rostov region,” said the Emergencies Ministry representative. Russia’s humanitarian aid convoy for eastern Ukraine’s self-proclaimed Donetsk and Luhansk People’s Republics (DPR and LPR - Donbas region) arrived at the state border with Ukraine earlier on Friday morning. The convoy comprises more than 130 trucks. About 80 trucks went to the Luhansk region and the rest - to the Donetsk region. The trucks brought a total of more than 1,200 tons of cargoes. Ukrainian border guards and customs service officials, as well as representatives of the Organization for Security and Cooperation in Europe (OSCE) mission met the convoy at the border. Spokesman for the Ukrainian border guard service Oleg Slobodyan said on the 112 TV channel the Russian side fully complied with the customs clearance procedure at the Ukrainian border. This is already the 9th humanitarian aid convoy of Russia for Donbas. The previous 8 convoys have delivered to Donbas since August 11 a total of more than 10,700 tonnes of humanitarian supplies. 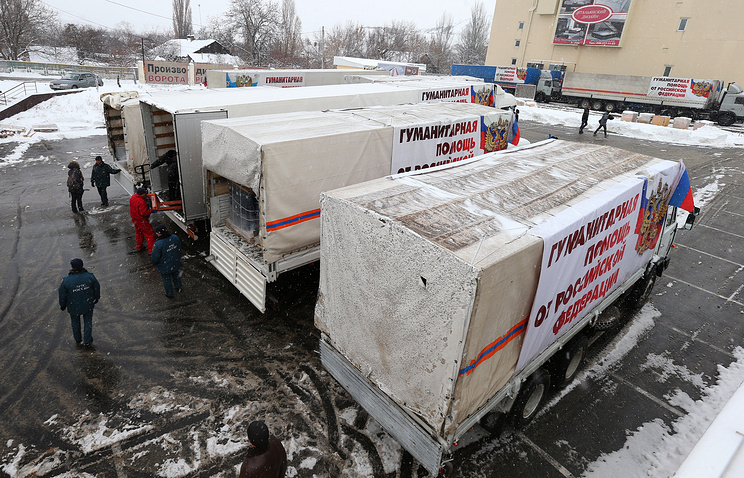 Before the New Year, one more truck convoy will be sent to Donbas with 1,000 tonnes of cargoes. “The convoy will deliver food supplies, materials needed for the infrastructure and social facilities’ restoration and New Year gifts and toys for children,” Russian Deputy Emergencies Minister Vladimir Stepanov previously said.